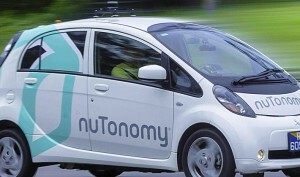 A driverless car startup company created at MIT called NuTonomy is planning to operate driverless taxis in Singapore. The firm has raised $3.6 million in funding to start the pilot program later this year at One North which is a business park in downtown Singapore. These driverless cars have a laser sensor on the roof of the car that captures million of data points per second to be able to detect what is in front of you. It also draws a map around you so that the car is aware of its surroundings. There’s a camera mounted behind the rearview mirror to help the car read signs and traffic lights. There are four radars (3 on the front and 1 in the back) to tell the car when there’s a road blockage ahead of time and when it is safe to change lanes. Those same radars can detect cyclists and when the road is clear at an intersection to make a safe turn. There’s another sensor on the back tire of the car that works along with the GPS to help the cars mapping position. The difference between all the companies that are trying to make driverless cars like Google and Tesla is the software. It’s difficult to make sure the car is adaptable to different weather conditions and is able to adjust themselves right away. Since Singapore is a very urban area, it’s a big risk to introduce driverless cars, but NuTonomy conducted their first driving test last month in a neighborhood in Singapore and passed it. NuTonomy is working to get their pilot program approved but meanwhile they are working on driverless software for companies like Jaguar and Land Rover.